Watching the Bears shut out the Dolphins last night, I was struck by how horrible that Tyler Thigpen played for the Dolphins. Now I know he was until last week the third string QB and he was only in there because of injuries to the Chads; but he was screwing up in ways that went well beyond any sort of inexperience factor. How about throwing the ball away? 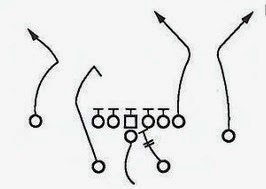 How about following through with your throws so your passes are not high? How about dumping the ball off short instead of fixating on a WR down the field, studying his progress while a strong rush hits you from three sides at the same time? The thing that gets me about him is that he was the starting QB in KC two years ago. He has a lot of experience for a 3rd stringer. Thursday night he looked like a squirrel loose in a classroom full of 4th graders. This was a very winnable game for the Dolphins. Jay Cutler is still trying to become the first QB to complete a pass by having it pass through the body of a defensive back. Fortunately for the Dolphins, none of their players were killed by an errant Jay Cutler pass - but they were so concerned with the possibility of dying on the field with a football-sized hole in their chest that they could not concentrate on actually catching the balls hurtling at them. The Bears having Mike Martz as their offensive coordinator with the personnel they have provided him is like asking General Schwarzkopf to invade Iraq with the Blue Man Group. Other than Matt Forte, they don't have a single skill player on offense that fit his system. They don't have a skill player on offense that would have started for Martz in Detroit! And that includes Cutler. I don't see Martz and Cutler as a good match. Martz's system requires mandatory throws at precise times and locations to work at all. I think that Martz might be a bit desperate if he is interested in this job. He does better with QBs with missing or crushed egos that are willing to completely change everything they have ever done at the QB position. Working with Cutler will be exactly like trying to jam Jeff George into the west coast offense in Washington and in Oakland. He imploded. The design and structure of Martz's passing game is completely alien to what everyone else does. It requires specific kinds of WR and a specific kind of QB. You will have to change your personnel to run it right - one of the reasons that Martz is out of the league. 3) A reputation for "climbing" and undermining the Head Coach and perhaps seeking his job. Any one of these are deal breakers for a lot of head coaches (especially #3). Martz probably is desperate and he should be. If he gets hired in Chicago, don't be shocked if he brings in a backup QB that he had at one of his previous stops and having that guy outshine Cutler in camp. He did not have this guy before, but I think that Jim Sorgi of the Colts would be a perfect fit for Martz. God knows he can't run the Colts offense. What a mess in Chicago. And what a mess in Miami. Brandon Manumaleuna, Chester Taylor and Johnny Knox all fit Martz's system extremely well. Not sure what you're talking about. As for criticism of the offense (specifically Jay Cutler), I'll refer you to the fact that 6 months ago the entire offense had a different playbook and our offensive line is atrocious; for him to lead us to a 7-3 start (no matter the schedule) under those conditions tells me that this system, and the players in it, are developing quite nicely. As for learning a new offense and all - how long did take for the Rams to start scoring well their first year? I'll remind you that he was unproven then and had to work with a backup QB.